Martin Scorsese directed The Last Waltz with an army of seasoned and acclaimed cinematographers behind the cameras, creating an innovative—and much more cinematic—approach to the live concert documentary than music fans had seen before. It documented the final concert performed by The Band's original lineup of Robbie Robertson, Rick Danko, Levon Helm, Richard Manuel, and Garth Hudson. Going down in San Francisco's Winterland Ballroom on Thanksgiving 1976, the event concert promoter Bill Graham dubbed "rock 'n' roll's last supper" featured a lineup of special guests, including Neil Young, Ringo Starr, Ronnie Wood, Joni Mitchell, Van Morrison, Neil Diamond, Muddy Waters, Eric Clapton, and Bob Dylan. Dylan was the most reluctant to join in the festivities, despite The Band having been his backing band from 1965 to 1966 and in 1974. Take a load off with these facts about one of the most celebrated shows in music history. 1. A LOT OF FAMOUS CINEMATOGRAPHERS WERE INVOLVED. The seven 35mm camera operators included Michael Chapman (Taxi Driver, Raging Bull), Vilmos Zsigmond (Close Encounters of the Third Kind, The Deer Hunter), and László Kovács (Easy Rider, Five Easy Pieces). Scorsese and Robbie Robertson (who also served as a producer) came up with a 300-page shooting script of diagrams and text that assigned the camera positions with the music lyrics and cues. According to the film's production notes, it was the first music documentary made on 35mm. 2. IT WASN'T MARTIN SCORSESE'S FIRST TIME WORKING ON A MUSIC DOCUMENTARY. He was one of several editors on Woodstock (1970), and worked as a montage supervisor on Elvis on Tour (1972). Robertson convinced Scorsese to direct the concert film six weeks before the show (the two later became roommates). 3. SCORSESE DUG UP THE VENUE'S FLOOR. With Graham's permission, Scorsese commissioned someone to dig into a section of the Winterland Ballroom floor in order to anchor a tower that could hold Zsigmond and his camera at the back of the venue, allowing him to get some great wide-angle long shots. 4. CHANDELIERS FROM GONE WITH THE WIND WERE USED. The show was designed by Boris Leven, who has served as production designer on West Side Story (1961) and The Sound of Music (1965). Leven created a backdrop inspired by the films of Luchino Visconti (Death In Venice, The Leopard), borrowing props from the San Francisco Opera's production of La Traviata and chandeliers designed for Gone with the Wind. Robertson wasn't sold on the elaborate decor. He told Leven, "Chandeliers? I don't think that's going to go over with Neil or Bob or the rest of the musicians. These people don't do chandeliers, Boris." 5. SCORSESE WAS WORKING ON NEW YORK, NEW YORK AT THE SAME TIME. Scorsese was supposed to be in New York editing the Liza Minnelli/Robert De Niro musical drama when he was in San Francisco preparing and shooting The Last Waltz. According to Scorsese, New York, New York producer Irwin Winkler was "very upset" when he learned this. 6. SCORSESE PURPOSELY DIDN'T SHOOT THE AUDIENCE. "I had the feeling that the movie audience could become involved with the concert if we concentrated on the stage," Scorsese explained. "Besides, after Woodstock, who wants to see the audience anymore?" 7. THERE WERE TURKEY DINNERS FOR ALL THE UNSEEN. The 5000 fans in attendance had to pay the princely sum of $25, which was more than triple the average price of a concert ticket at the time. However, they were well fed when the doors opened at 5 p.m.: 220 turkeys, 500 pounds of cranberry sauce, 90 gallons of brown gravy, one ton of candied yams, 800 pounds of mincemeat, 6000 rolls, and 400 gallons of cider were available. For non-turkey eaters, there was also 400 pounds of fresh salmon, provided by a childhood friend of Bob Dylan's. After dinner, the patrons danced to the music of a 38-piece orchestra, joined by three teams of professional ballroom dancers. 8. BOB DYLAN ATTEMPTED TO BACK OUT AT THE LAST MINUTE. Fifteen minutes before he was scheduled to go on, Dylan arrived at the venue and announced that he would not be appearing in the film after all. He was reluctant largely out of concern that The Last Waltz would compete with his own upcoming concert film, Renaldo & Clara (1978). In his memoir, This Wheel's on Fire: Levon Helm and the Story of the Band, Helm wrote that Scorsese "went nuts." 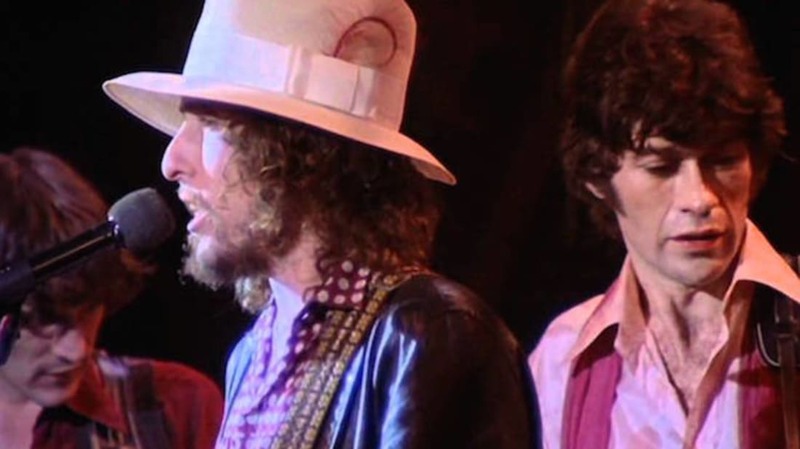 With five minutes to go, Graham convinced Dylan to agree to be filmed for his last two songs only. To make it clear that he wasn't being filmed, the cameras were physically turned away from the stage during his first few songs. After the show, Dylan's lawyer seized the footage that was shot of his client for future negotiation purposes. 9. NEIL DIAMOND TRIED TO MAKE A JOKE TO DYLAN ... IT DIDN'T GO OVER SO WELL. As the legend goes, Diamond, riding high after his performance of "Dry Your Eyes," challenged Dylan to "follow that." Dylan allegedly responded by asking Diamond, rhetorically, "What do I have to do, go on stage and fall asleep?” When Rolling Stone asked Diamond about the incident in 2010, the story changed. "Actually, it was before we both went on. He was tuning his guitar and I came over to him and I said, 'You know, Bob, those are really my people out there.'" Diamond claimed he was only joking, and all Dylan did was look at him "quizzically." 10. PEOPLE WONDERED WHY DIAMOND WAS THERE IN THE FIRST PLACE. Levon Helm was one of those people. "When I heard that Neil Diamond was going to play I asked, 'What the hell does Neil Diamond have to do with us?'" the drummer asked in his memoir. Diamond was invited after Robertson produced his album, Beautiful Noise; "Dry Your Eyes" was a number Robertson and Diamond wrote together. 11. NEIL YOUNG INTRODUCED HIMSELF TO DIAMOND. SORT OF. Backstage, Young walked up to Diamond and said, "Nice to meet you. I'm Neil Sedaka." 12. YOUNG'S "BOOGER" HAD TO BE EDITED OUT. When the movie was projected for the first time, Neil Young's manager was horrified when he saw his client's face. "There was a rock of cocaine falling out of his nostril," the film's executive producer, Jonathan Taplin, remembered. When Young's manager suddenly blustered that he was refusing to allow "Helpless" to appear in The Last Waltz, Taplin went to a special effects company to fix things, telling them: "This guy has got a booger in his nose, can you fix it?" After a few days they responded, saying, "We've invented a travelling booger matte." 13. SCORSESE AND ALL THE CAMERAMEN ALMOST MISSED MUDDY WATERS'S PERFORMANCE ENTIRELY. Thanks to The Band making some changes on the fly, Scorsese grew frustrated, screaming into his headphones to make last-second cue changes to his camera crew. Kovács couldn't handle it and ripped off his headset. With Scorsese thinking a different song was coming up, he ordered all the cameras to shut down—just as blues legend Muddy Waters launched into "Mannish Boy." Fortunately, Kovács didn't hear Scorsese's order, which is why the only footage of Waters's performance came from Kovács's camera. 14. IT WAS INITIALLY RATED R BY THE MPAA. The R rating was due to language used in the film. After an appeal, it was bumped down to a PG. 15. IT WASN'T, IN FACT, THE BAND'S FINAL PERFORMANCE. It was just the last with Robertson, who was the only one who wanted to stop touring in the first place. The Band reformed without the guitarist and began touring again in 1983. 16. LEVON HELM WAS CRITICAL OF THE MOVIE. "As far as I was concerned, the movie was a disaster," Helm wrote in This Wheel's on Fire. "For two hours [at a screening] we watched as the camera focused almost exclusively on Robbie Robertson, long and loving close-ups of his heavily made-up face and expensive haircut. The film was edited so it looked like Robbie was conducting the band with expansive waves of his guitar neck. The muscles on his neck stood out like cords when he sang so powerfully into his switched-off microphone."